The Ragdoll cat is a relatively new breed of cat, its origins are clouded in mystery. It orginated in Riverside California with a woman named Ann Baker. The breed allegedly began when a white angora persian cat named Josephine was hurt in a car accident this event was attributed to the reason that Josephines kittens were very laid back and good natured. Fortunately, Josephine was not seriously injured and went on to have more litters, from which the Ragdoll cat breed evolved. The ancestors of today's Ragdoll kittens all evolved from Josephine. Every Ragdoll must be able to be traced back to Josephine and an extensive list (in the USA) shows every breeding cat from Josephine right down to todays breeders. 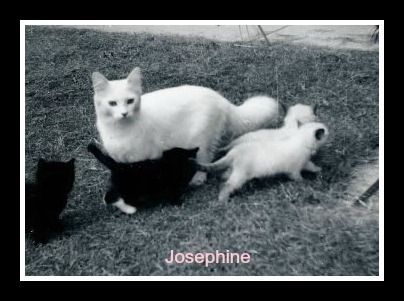 Josephine with her kittens, 1965 Left to Right, Geuber, Mitts, Tiki and Kyoto. The line began when Josephine had a litter that was sired by an unnamed male, said to have been the Sacred Cat of Burma which produced Raggedy Ann Daddy Warbucks. Their breeder and owner, Ann Baker, realised that this litter was different from any of Josephine's previous litters and that these kittens were special because she realised that she had a handfull of kittens with some remarkable traits and knew that she had to explore the new breed that she had stumbled upon, some may say by accident. Ann Baker kept some of the litter from which to breed further and see how the kittens would turn out. She found that the kittens bred true, and this still continues down to the Ragdoll breed as it appears today. 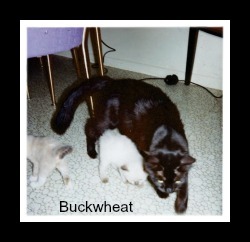 Buckwheats kittens, Kyoto on left seal mitted and Tiki Chocolate Colorpoint. They would be become the foundation for the Dark Side. 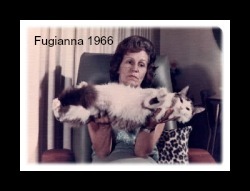 Fugianna became the first ever Bi Color Ragdoll and would become the foundation for the Light Side. 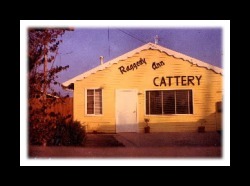 The Ragdoll cat which was founded in California by Ann Baker and which had most of its very early breeding also done by its founder has suffered from a unique legend and a lot of misunderstanding. 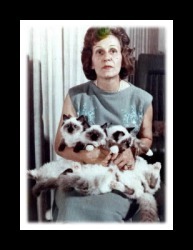 When Ann Baker sold her kittens she did so under strict guidelines. 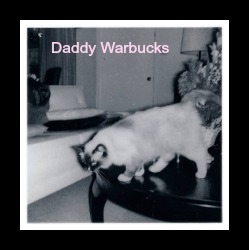 Their pedigrees were crested with the IRCA (a ragdoll association established by Anne Baker) symbol to prove that they were traced directly back to Josephine. Purchasers wishing to breed were expected to do so under a strict selling licence. 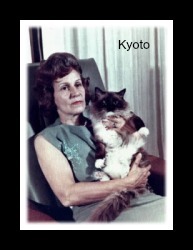 When the Daytons of Blossom-Time cattery purchased cats from Ann Baker, they rebelled against the stringent trading terms and breeding guidelines. They began a long campaign to get the breed onto a sound genetic footing and to obtain recognition from major cat organisations. This was done so that Ragdolls could be shown and recieve the recognition that was due to this wonderful breed. The Daytons were able to balance the genetics of the breed and avoid too close inbreeding by advocating that matings take place between the "dark" side and the "light" side. The dark side descending from Raggedy Ann Tiki who had a black grand dam (the black Persian) and the light side descending directly from Josephine (the white Angora Persian). Their plan went a long way in the development of the typical Ragdoll type of today. As breeders, we need to be very carful that the Ragdolls we breed are healthy, and not too closely inbred, that we, without thought, carelessly ruin all the good work, time and effort that the past and present breeders have put into breeding big, healthy, disease free and defect free cats. We need to protect our breed to help continue the formation of this magnificent breed and carry it on into the future.